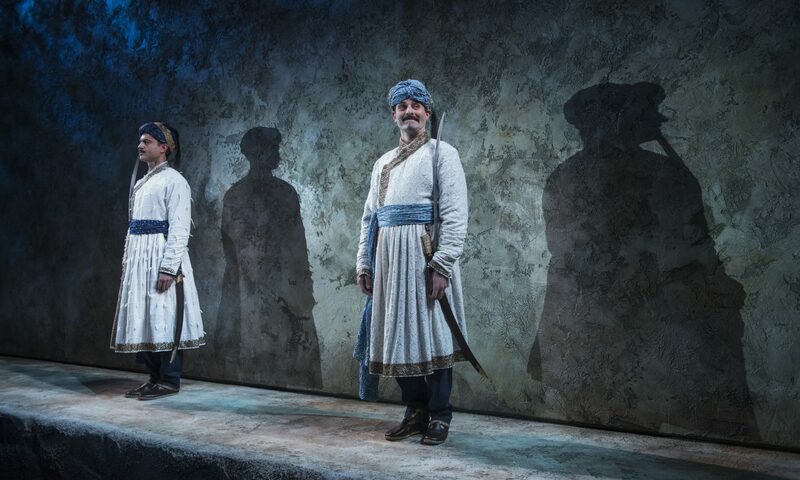 Rajiv Joseph’s GUARDS AT THE TAJ, currently in its Chicago premiere at Steppenwolf Theatre, and masterfully directed by Amy Morton, is as much a meditation on the soul’s need for beauty as it is a study of the mechanisms of tyranny. It’s 1648 in the city of Agra. Humayun and Babur are guarding the walled city-within-a-city where the Taj Mahal is being constructed. The all-powerful Mughal emperor Shah Jahan, in mourning for his wife Mumtaz Mahal, has commissioned the most beautiful building in the world. At dawn he will finally reveal it. Will these two young men turn and steal a glimpse? This begins a cascade of questions about the bodily costs of exercising free will versus the psychological costs of suppressing it. Humayun’s father has some limited status. Under the conditional scope of his protection this means his family is able to access the things that make life tolerable, or almost tolerable. Humayun reminds Babur to appreciate the fact that they are “close to the center.” That means warm beds and hot meals. Far from the center people are starving. When safety and comfort are made scarce people will go to great lengths to compete for it. Under pain of death it is easy to compel people to victimize others in order to prevent or delay their own victimization. In Shah Jahan’s empire everyone is enslaved to his will, from the women in the imperial harem to the masons building the Taj. Ustad Ahmad, his lead architect, is the closest among his subjects to free. Ustad derives this sense of freedom from his pride in his work and perhaps a sense of ownership. This turns out to be dangerous. When he asks the emperor to recognize the humanity of his 20,000 person crew Jahan’s rage is boundless. Not only shall he own the most beautiful building in the world, but he will take extreme measures to make certain nothing more beautiful can ever surpass it. Babur cannot accept this decree calling it the death of beauty. But as Humayun fatalistically puts it, “If the emperor says beauty is dead then beauty is dead.” To them Agra at this moment feels like the center of the modern world. They don’t know about Rembrandt painting in Europe or the golden age of landscape painting underway in China. But they do dream of escape. Babur talks of inventing a flying platform. If he had one perhaps he could have traveled to other countries and found beauty alive and well. Instead, he has a nightmare the magical flying machines of his fantasies are weaponized. The terrible sounds of drones overhead, death from above, fill up the theater, closing the gap between then and now. Joseph wrote GUARDS specifically for Omar Metwally and Arian Moayed, who originated the roles they’re now reprising at Steppenwolf. They inhabit their characters with tremendous sensitivity and, armed with Joseph’s wildly smart and imaginative dialogue, a good dose of humor. Amy Morton’s fearless direction guides us from the gruesome to the sublime. And Tim Mackabee’s scenic design, combined with David Weiner’s lighting include a jaw dropping reveal that will be forever burned into my visual memory. The production also benefits from a robust soundscape including original music by Rob Milburn and Michael Bodeen. Ultimately, the most beautiful thing in this play turns out to be the friendship between Joseph’s two characters. And while GUARDS reminds us a desire to possess, harness and hoard beauty has always been a hallmark of tyrants. It also reminds us that in this project they will always, inevitably, fail.